I have fallen in love with painting…again. As far back as I can remember, I loved drawing, painting and creating art, but I could never find the space or the medium that felt “perfect”…so I didn’t do much of anything with it. A few months ago, I had a revelation about my work and my life. I realized that I didn’t really care what I was doing, I cared about how I was feeling, and how I wanted to feel, while I was doing “it” (life). I wanted to get up everyday knowing that whatever I was doing in the moment (cleaning kitty litter, having tea with a friend, working with clients, helping my mother, making a phone call, writing, reading a book, ….) had the feeling of Life in it. And so I said a prayer that went something like, “I want my life to be filled with loving, fun, meaningful, activity.” That was it. I told my higher self how I wanted to feel, and decided to trust in this larger part of me (Wisdom) to fill in the blanks on exactly how that would show up and what it would look like. I didn’t then try to figure out what this should be. The desire to paint again came after this “prayer”. When I finally decided just to paint, my living room was adequate as a studio, and my husband, Jack, had the perfect medium; old wood that he had collected over the years; panels from 18th century doors, turn of the century crates and boxes, lids from broken wooden trunks… everything that I needed was right here…when I finally decided just to do what seemed like a fun thing to do. Mary, it is so true that we do have the power to change our lives but I can honestly say that I’ve lived a life of intrepidnous (is that a word?). So when a friend of mine photographed my textile work for an entry to an exhibit and said afterward: “you should really think about going to art college” I thought of every reason that I should not…I was too old, I still had a child at home, a teenager at that and besides “I’m just a quilter”. That to me seem to be the clincher…I was just a quilter. Yet, when I got out of bed the following morning, I thought ‘why not, what if I never tried to get into art college, would I regret never having tried’. I called the college that morning, found that the interviews for prospective students were scheduled in the following two weeks, I made an appointment for an interview and when I arrived at the school, I found the hallways lined with young people all with large black art portfolios. I went into the interview studio, watched as these young people pulled such beautiful drawings out of their cases as I laid out my three quilts from a green garbage bag onto the floor of the studio. Two teachers looked at my work and dismissed me. A third teacher took interest in my work. He was the head of the industrial design department. He asked what I wanted to learn at art college if I was admitted, I told him colour and design, he took me to the admissions office, made an appt. for me with the head of the design dept. and then said: “if she doesn’t let you in, don’t bother trying again”. I graduated some years later and in all that time, never saw that teacher again until one night, speaking to the historical society near my home in the country an hour north of the city, a gentleman walked in with a slide projector for me to use that night. And that man was the teacher who last interviewed me that day, now retired from the college. If that man had not taken the time to really listen to me, to consider my work, the opportunity would have been lost. I nearly scuppered it myself by being so negative about my chances of applying to the college. I think it has to be a matter of timing in your life and a willingness to take a chance that can change your life. And here years later, I still work on my textile work but I run a bed and breakfast……who would have thought. My work will never set the world on fire but I needed to recognize that after being at the college where I saw so much creatively fine work that I must be happy with the work that I can do and be satisfied as well. If it brings me pleasure in the making of it, that’s what counts most. So glad you are running with this! I am always amazed at the power of creativity to self-propel once given the tiniest chance at expression. There is a joy in painting that is unlike any other I have known – keep it up, it is beautiful work! Gwen said it perfectly ~ so happy that you have run wih this! You continue to inspire us in so many ways. I feel a change coming on in me and while I’m not sure where it might lead, my creative side is saying hey, allow some time in your crazy life for me! Dear Mary, your paintings are inspiring and beautiful! Thanks for an uplifting message this morning about enjoying life in all it’s experiences. I love how musicians say they “play” the piano, “play” the violin, or the banjo, or the penny whistle. . . If there isn’t that element of play and joy in creating something, it probably won’t have that authentic shine. Sure, there are lots and lots of hours of practice, concentration and hard work, but oh! 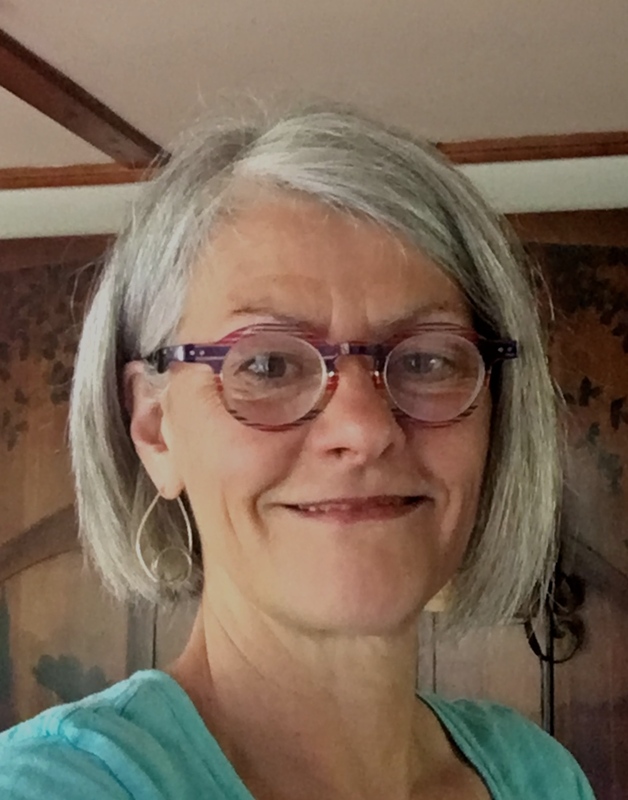 to sit and play with the creative Muse, – I think she’s there for every one of us in different guises, and bravo to you, Sandy P for inviting her into your life even though you had all those doubts. Think of this, too, God didn’t set the grand piano onto the earth’s stage, but gave man the mind and creative likeness (made in His image) to imagine things and make things out of things that never were. Ebony, ivory, the steel and silver in all those 88 strings – the horsehair on the bow of a violin – the pine and maple trees that gave of themselves to the hands of Antonio Stradivarius to be transformed into masterpieces. The possibilities are endless – let’s play today! Happy weekend all, and to all the fathers in our lives, Happy Father’s Day! Mary this work is quite astounding. Twice today I have seen Carpe Diem. Seize the Day!! I would love to own a Carpe Diem painting by you, to go with my blackbird, which I love, love, love. You are amazing Mary, in your art and also your wisdom. 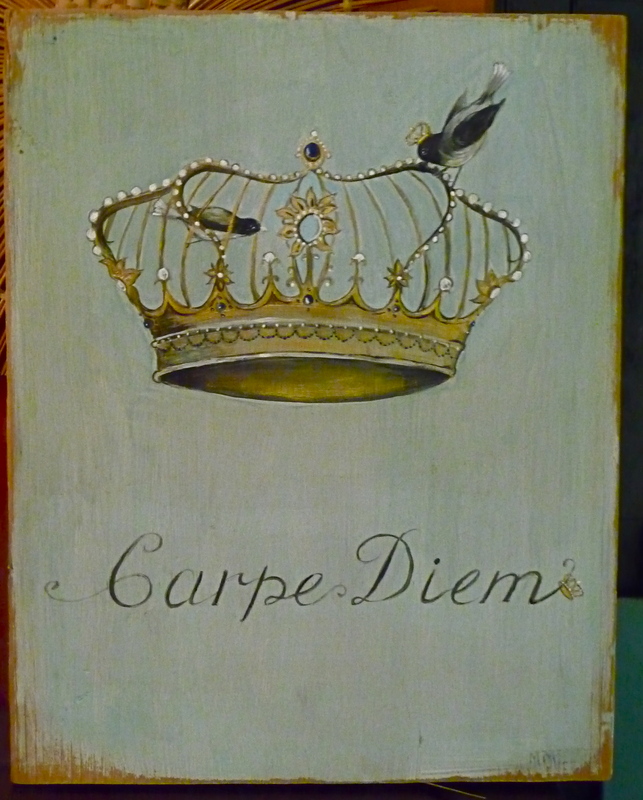 I would love to have your Carpe Diem painting and one of Sandy P’s quilts. Thank you everyone for your wonderful comments….I’ve put “Carpe Diem” on my “My Artwork” page (with some details about its shape, weight and where the wood come from) but it just sold…so it is there for examples of the work that I do. Your experience with getting back to your painting , and your process in getting there is something I can so very much relate to, Mary. I am so thankful that you shared this process. I had reached a mental block about playing my piano… But now after a few days of being back at the keyboard my piece is coming together already , when I thought it would take weeks. I too was looking for a perfect situation, such as blocks of uninterrupted time, all my duties done ( ha ha ) before I sat down to ” play” as Susan calls it.. But you said it so well when you mentioned how it was the feeling of living a fulfilled life that you were searching for. And it was your prayer. I can envision you painting happily away with your furry friends surrounding you, right in the middle of life. So here I sit at my piano, in the midst of mild chaos doing what I certainly love , no matter that I have a dusty floor and papers stacked here, there and everywhere there’s work to do! But I go to sleep once again with pages and pages of reawakened music in my mind. For me, your paintings capture the distilled essence of all that you share with us on your blog. I look at them and feel all that wisdom, light and spirit right in my heart. It is like a get out my head free card because I don’t have to run all that wisdom past my mind first; it just pierces me. Thank you so much for sharing this journey with us. What a unique interpretation of Carpe Diem. I could look at it for a very long time.